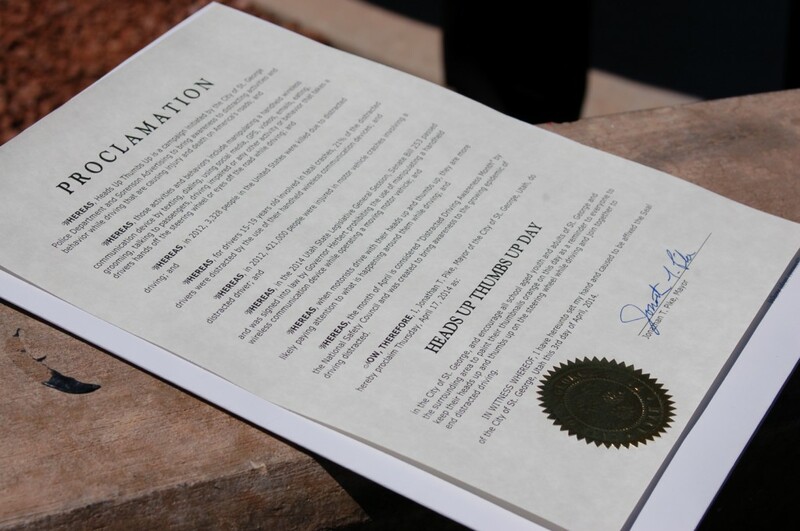 The designation comes in concert with the city’s massive efforts to raise awareness of distracted driving – especially among teens – and the recently passed legislation that strengthens the state’s distracted driving law. 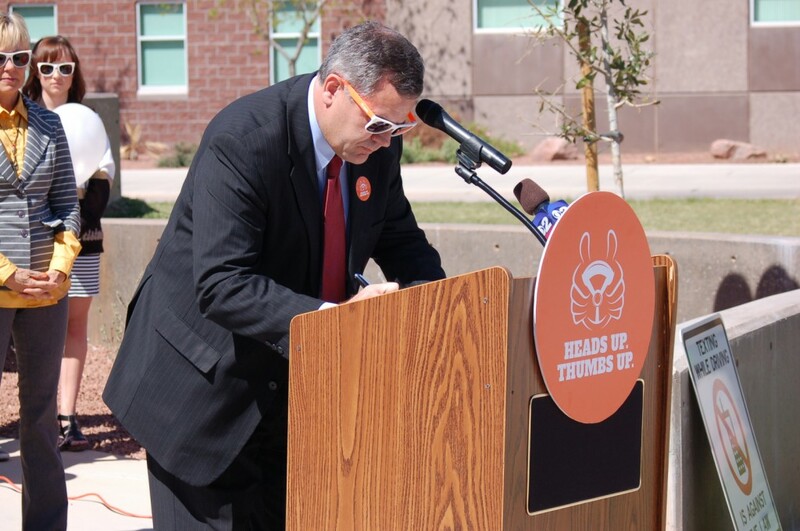 City Mayor Jon Pike read and signed the proclamation in front of local and state representatives, the press, and members of the high school’s student body. 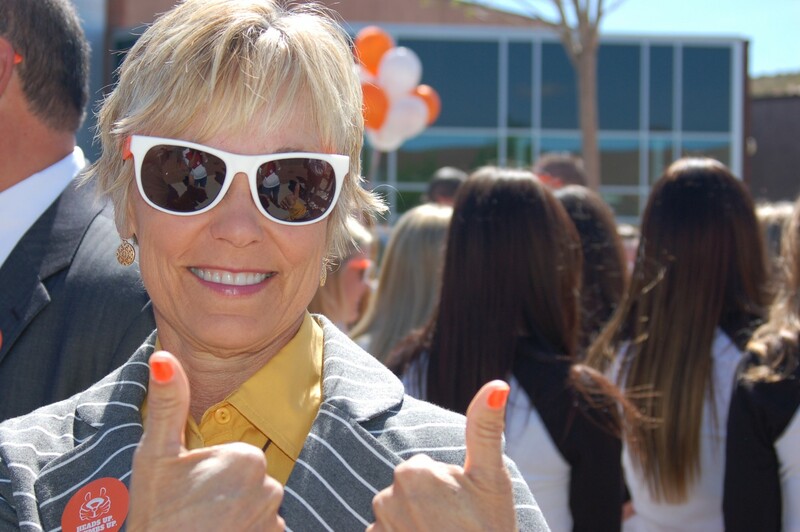 As part of “Heads Up, Thumbs Up Day,” residents of the community are encouraged to paint their thumbnails orange to remind them to keep their hands off their cell phones and on the wheel while driving. They are also encouraged to take a pledge not to drive distracted. 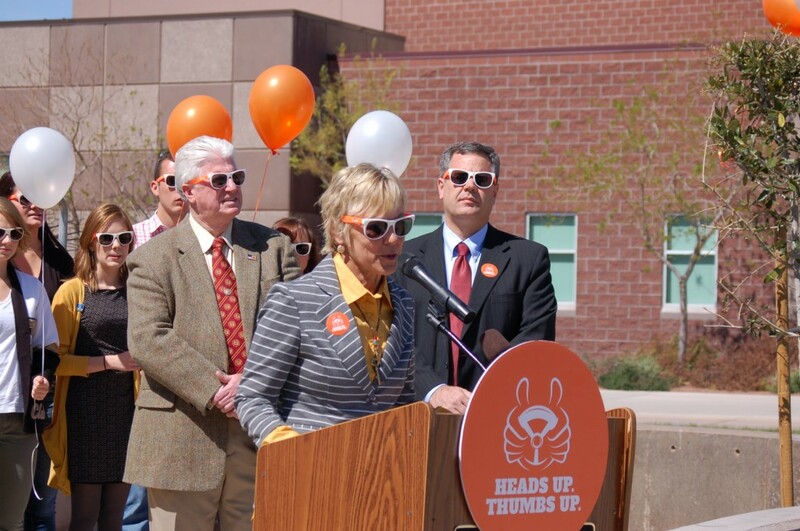 Leslee Henson, a St. George resident whose husband was hit and killed in an accident that was alleged to be a distracted driving incident one year ago, addressed the crowd about the campaign and the state’s new distracted driving law. “This campaign is such a great thing to remind us all to keep our heads up, our eyes on the road, our thumbs up, our hands on the wheel,” Henson said. Rep. Don Ipson, who presented the new bill to the House of Representatives spoke to those in attendance and explained the legislation. “What this bill does is it prohibits us from manipulating the phone,” Ipson said. Sen. Steve Urquhart who sponsored the bill was not in attendance. For more information visit the Heads Up, Thumbs Up website. Thank you Maudie! I hope you being my new hero is rewarding enough! Thanks for your thhgouts. It’s helped me a lot. It’s not just texting while driving, it’s also people blatantly running stop signs and stop lights, failing to yield right of way to traffic in traffic circles, aggressive driving in areas of heavy traffic and the heavy footed me first attitude many exhibit by racing other cars to a turn lane or to get on the freeway first from an on ramp.. Lets get some signage on the traffic circles like other states have.. YIELD TO TRAFFIC IN THE CIRCLE.. That’s the law and most people are ignorant of it and it needs to be enforced both with signs and ticketing..